It is not clear yet if the great technological developments we are living mean a true industrial revolution. What is anyway sure is that the so called Industry 4.0. is brining many organizational and technical changes in companies and VET colleges need to be ready to transmit this to their students. Through the LAIT 4.0. project, cofinanced by the Erasmus+ Programme, with help of IK4 Tekniker, 7 teachers from HETEL´s schools, 4 from Dundee and Angus College (Scotland), 4 from APRO Formazione (Italy), 4 from Kaunas Technical Vocational Education Centre (Lithuania) and 2 from ROC Da Vinci (Netherlands) will update their technological knowledge to be able to assist SMEs and VET students in this adaptation process. Last Thursday and Friday, 24th and 25th of November 2016, the project team met in the VET schools Maristak (Durango) and Zabalburu (Bilbao) to start working. 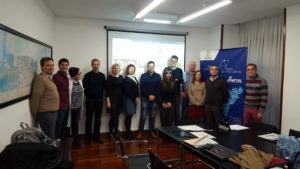 During the meeting we developed a first draft of the training programme in industry 4.0. which will be provided in May by IK4 Tekniker to 18 VET teachers from the Basque Country, Scotland, Italy, Netherlands and Lithuania. Course on industry 4.0. Our programme! We launch our project Website! admin on Course on industry 4.0. Our programme! Claudio Sdogati on Course on industry 4.0. Our programme! Goran Cubric on Course on industry 4.0. Our programme!